This paper presents a fuzzy strategy for voltage control in power distribution systems. This control system will act on the tap changer of power transformers. Fuzzy system techniques have been use to turn the voltage regulator relays into adaptive devices. The purpose of the paper is also to operate only in the distribution substation, performing voltage and current measurements. Fuzzy systems are able to process uncertain data, which allow creating controls that automatically improve the voltage profile of distribution substations, meeting the requirements of regulatory agencies as well as needs of electricity distribution companies. To exemplify these assertions, this paper presents real data. Electric power is an indispensable product for the maintenance of society activities. The demand of consumers and regulatory agencies for a better quality in electricity supply only emphasizes this fact. 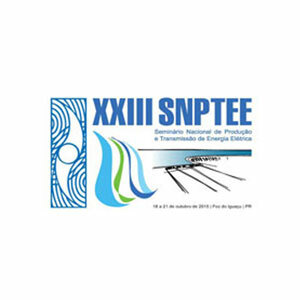 As concessionaires of the Brazilian electrical system, companies are subject to ANEEL (Brazilian Electricity Regulatory Agency) resolutions regarding the compliance of steady-state voltage levels. For distribution voltages greater than 1 kV and less than 69 kV, which is the focus of this paper, ANEEL Resolution no. 505 establishes the most suitable levels that electricity distribution company should provide to consumers . Table 1 summarizes the classification of voltage ranges observed in the Brazilian electrical system, and based on the analysis of these ranges, we may note that voltages between 0.93 and 1.05 p.u. relative to a Vrated voltage of 1 p.u. are within the voltage range named Adequate, which is the operating range of distribution systems. Note that this range is asymmetric relative to 1 p.u., 0.93 p.u. being the minimum voltage and 1.05 p.u. the maximum voltage. Voltage values greater than 1.05 p.u. fall within the voltage range called Critical. Supplying electricity within this range could damage consumer appliances and equipment. Critical voltage levels are also found for values less than 0.90 p.u. relative to the rated voltage. The voltage range named Precarious is within 0.90 and 0.93 p.u. Note the absence of a Precarious voltage range above the Adequate range for voltage levels between 1 kV and 69 kV. Supplying electricity within the Precarious and Critical voltage ranges may result in the application of penalties to electricity distribution companies, according to ANEEL Resolution no. 505. Therefore, a suitable voltage control may prevent financial losses to these companies. There is a high potential of applying intelligent systems – specifically those based on fuzzy systems and controllers – to dedicated voltage control systems, because the most attractive features of these systems are their enhanced ability to solve non-linear issues and handle eventual uncertainties related to the process. Taking into consideration all aspects above involved in the compliance of voltage levels, the purpose of this paper is to put forward a voltage control strategy that automatically operates only with the distribution substation transformer equipped with tap changer. This control should turn tap changing operations into actions capable of improving the voltage profile for distribution system consumers. One of the drivers of the actions above is the fact that the main problems reported by consumers are voltage levels below rated value, thus jeopardizing the quality of the electricity. The voltage drop along the distribution feeder ends up exposing consumers to voltage levels outside the operating standard considered as Adequate. Therefore, consumers, specially those located at a greater distance from the suitable, will be supplied with electricity within proper voltage levels when the system operates at higher voltages in the distribution substation secondary busbar. The non-linear behavior of certain loads in a distribution system makes voltage control a complicated task . In the literature of the field we may find several papers through which researches seek solutions to solve this type of issue. As an example of these solutions, the purpose of the proposal put forward in  is to find the best positions of transformer taps over the time according to customer needs. For such, conventional optimization methods were used that provide satisfactory results regarding voltage regulation, effectively minimizing voltage deviation relative to the reference voltage. However, the number of tap switching operations was relatively higher than in conventional approaches. In , a proposal using intelligent systems was examined to determine the programmed dispatch in capacitor switching and tap changing operations, taking into account the load forecasted for the following day. Genetic algorithms were used to split the load curve, as well as to find the optimum staging between devices. This strategy reduced the number of tap changing and capacitor switching operations, as well as improved the voltage profile and minimized power losses. However, the application of this technique requires high computational effort to obtain the regulation parameters. The proposal presented in  uses dynamic programming to control voltage regulation devices associated with the substation and fuzzy systems to those related to feeders. The coordination between both types of devices, substation and feeder devices, is made by conventional algorithms, which resulted in decreased power losses and considerable voltage profile improvement. In , researchers used a neural network and the fuzzy dynamic programming technique to make a programmed dispatch for the 24 hours of the following day. This is a hybrid system of the sequence type that makes a preliminary dispatch by means of neural networks, then uses the fuzzy dynamic programming to find the final dispatch. The control proposed provided significant improvement in the voltage profile and power factor was observed, but the number of tap changing operations was relatively higher in comparison with conventional techniques. The proposal of investigating the voltage and reactive power control put forward in  is to find an optimum dispatch for the transformer tap changer, as well as the status of capacitors installed along the feeders and also in the substation secondary busbar, observing some hours in the future. Fuzzy systems as well as Simulated Annealing were used to refine the response of the fuzzy system. The strategy described has shown good results both for fuzzy system refining and for voltage and reactive power control solution in distribution systems. In , an innovative manner of coordinating voltage control devices in a distribution system is presented, where the reactive power behavior is used to automatically coordinate the action of LTC (Load Tap Changer), capacitors and voltage regulators installed along the feeder. This strategy improved the performance of the system and consequently the quality of power supply for final consumer, as the total current was reduced. Among all proposals investigated, only the one presented in  performs measurements and control only in the secondary bus of the substation, and such performance strategy is also assumed in the work proposed herein. The others present efficient strategies, but they need high computational effort or perform by programmed dispatch, complicating real time applications, which is also one of the main objectives of this work. Besides, all have purposes that differ from those aimed here, because they are focused in controlling the voltage as closest as possible from the reference voltage, thus ignoring the action of increasing the voltage above reference in cases where heavy loads are demanded and avoiding switches in light load situations. These studies have further driven the search for an intelligent tool capable of streamlining transformer tap changing operations and improve the voltage profile, for such operating only on the distribution substation. Voltage regulation or automatic voltage control via power transformer tap changing is driven by the voltage regulator relay, increasing or reducing the LTC voltage as needed. Relays that implement the ANSI 90 function considered as conventional are not capable of operating properly under some system behavior conditions such as switching, abnormal load variations, among others, as they only monitor the secondary busbar voltage. Due to the dynamic features of the Brazilian electrical system, we may state that this is a problem difficult to handle when conventional techniques are used, which justifies the use of intelligent computational techniques. In this paper an intelligent strategy was developed, called Reference Adaptive Control (CAR), using the fuzzy logic to apply stimulus at the reference voltage of a conventional voltage regulator relay. In this case, the reference voltage of the voltage regulator relay becomes dynamic, and may be updated at any time. However, the decision of whether switching the tap or not is still taken by the voltage regulator. Modeling control problems by means of fuzzy logic allows processing qualitative information, as this logic is capable of making decisions even on an environment of uncertainties and inaccuracies where this type of data – and even conflicting data – is processed . Therefore, the fuzzy strategy developed is capable of processing these variables in a CAR in a proper manner, adding ruggedness and contributing to an optimized voltage control. The strategy to be presented proposes an auxiliary decision-making system to be integrated to existing voltage regulator relays. The purpose of such system is to make the reference voltage adjustment to become dynamic for the conventional relay. In this case, the fuzzy system is used as an intelligent auxiliary module supporting the conventional relay. Figure 1 illustrates the simplified CAR operation diagram. The relay with intelligent functionalities will monitor the voltage deviation and the load (active power). The fuzzy control output is a sign of increase or reduction on the current reference of the voltage regulating relay. Thus, inserting this intelligent module in a conventional relay makes the reference voltage adjustment to become dynamic. CAR will increase or decrease the reference voltage according to the Adequate voltage levels specified in Table 1, also taking into account the purposes of the paper, i.e., increase the average voltage and streamline tap switching operations. Thus, we seek a more flexible use of the tap, increasing the Medium/Heavy load by increasing the reference voltage, and decreasing the number of Minimum/light load switching operations by keeping the reference voltage unchanged. Besides, the fuzzy system allows preventing premature switching operations by keeping the reference voltage unchanged. Active power normalization was based on an average value by means of the analysis of history data. Thus, so that this strategy may work it is necessary to adjust this average power value, so as the fuzzy system may be adapted to any substation. The adjustment is performed by a module that calculates the average power based on history data. 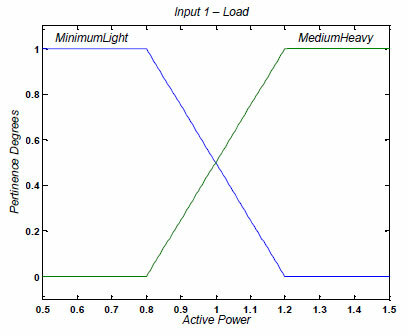 Figure 2 illustrates the pertinence functions for active power. The purpose is to distinguish between two basic situations: under Minimum/Light voltage the system should preserve tap changing; under Medium/Heavy it should keep a higher voltage, according to the limits in Table 1. With respect to the second input (voltage deviation), this is calculated using the equation shown in (1). The deviation variable was represented in its entire universe of discourse through five pertinence functions, as shown in Figure 3, where the terms used are NegativeHigh, NegativeMedium, Low, PositiveMedium and PositiveHigh. The use of 5 pertinence functions for this input allows combining more rules to increase the Medium/Heavy load voltage and reduce the Minimum/Light load switching. 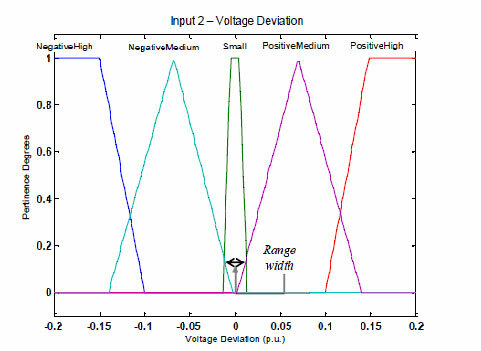 The fuzzy control performance range width is defined through pertinence functions’ crossing points of the voltage deviation parameter, where the common point between Low and PositiveMedium indicates the upper limit of the range, whereas the common point between NegativeHigh and Low indicates the lower limit of the range. 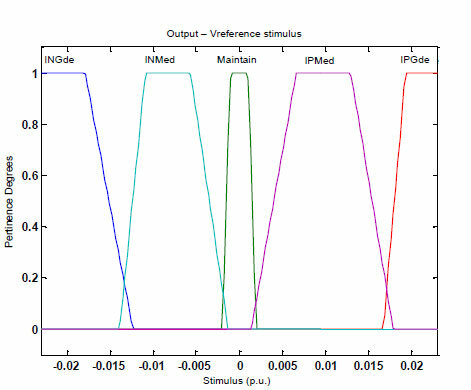 The linguistic output variable, i.e., the reference voltage stimulus was mapped through five pertinence functions as provided in Figure 4, i.e., INGde (High Negative Increment), INMed (Medium Negative Increment), Maintain, IPMed (Medium Positive Increment) and IPGde (High Positive Increment). Thus, the fuzzy output is a real number, which will be directly forwarded to the relay aiming changing (increasing/reducing) the reference voltage. When the stimulus is within the Maintain range, it means that the reference voltage of the relay remains unchanged. The fuzzy rules can be better understood through Table 2. In Table 2 we can see a predominance of positive increases in Medium/Heavy loads, while in light load there is a predominance of Maintain. These rules were prepared to save switches in Minimum/Light load and to increase the voltage in Medium/Heavy load. In order to investigate CAR behavior in voltage control, the Matlab software was used to implement the conventional and the fuzzy approach, and to perform several simulations based on real historical curves of active and reactive power of substations managed by ELEKTRO – Eletricidade e Serviços S/A. From these real curves, a simplified load flow was executed to determine the voltage in the substation for each value of active and reactive power supplied, which are then presented to the simulations of the fuzzy and conventional relays that perform their mathematical operations to decide whether to switch or not. 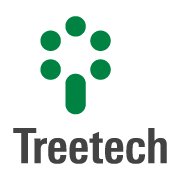 Following the complete adjustment of the fuzzy system, the laboratory test stage was initiated, and CAR strategy was implemented on a voltage regulator relay prototype, the AVR of company TreeTech Sistemas Digitais. After the intelligent strategy was validated in laboratory, several improvements were made to the AVR prototype so that field tests could be performed. Mogi Guaçu 2 substation, which is equipped with two transformers and is managed by ELEKTRO, was selected for the installation of the intelligent voltage regulator relay. 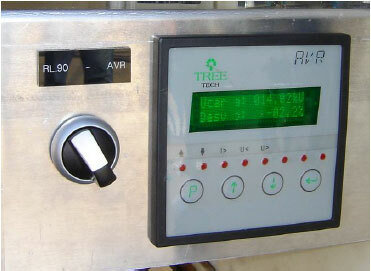 Initially, the AVR was installed in transformer TR-1. The relay that was already operating in this transformer was kept as a back-up. A selector switch was inserted to activate the intelligent or the conventional relay (Relay 90), as illustrated in Figure 5. For a 7-day period of evaluation of the operation of the fuzzy AVR, the average voltage was kept 115 V higher in TR-1, versus the same period of operation of the conventional relay (Relay 90). Within the heavier load range the average voltage was 164 V higher in TR-1, as shown in Figure 6. Also for a 7-day period of operation of the fuzzy AVR, the average voltage was kept 57 V higher in TR-2. Within the heavier load range the average voltage was 122 V higher in TR-2, as shown in Figure 7. For a one-week period the AVR Fuzzy relay increased the voltage in the secondary busbar of Mogi Guaçu 2 substation, providing several benefits to the customers as well as to the company, always complying with the requirements of regulatory agencies. The analysis of switching operations for the one-week period has also shown that concessionaire thresholds – 100,000 switches in 6 years – were not exceeded, which evidence the more rational use of tap changers, better exploring the distribution system operating range. The fuzzy control has shown excellent results when applied to voltage regulation in the field, thus validating the simulations and laboratory testing. 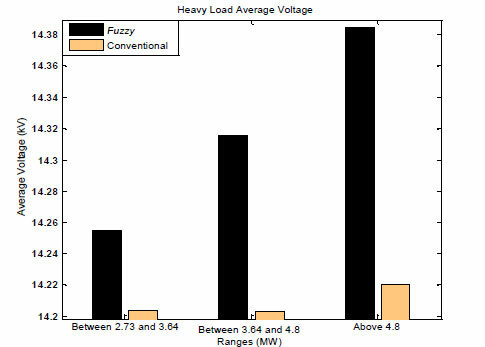 Thus, the main potentialities of the fuzzy strategy presented in this paper are as follows: i) hardware easy to implement; ii) automatic adaptation to changes occurred in substation load demand; iii) output results are produced in a very fast manner, allowing real-time applications; iv) automatic elevation of voltage profile under heavy load conditions; and v) optimization of the number of tap switches under minimum/light load conditions. Moreover, the procedures performed by the fuzzy strategy are based only on the values measured of the input variables, and eventual inaccuracies related to the input data acquisition device are also intrinsically managed by pertinence functions. The continuous exploration of the range, thus streamlining tap switches under light load and searching the best voltage profile under heavy load, show benefits both for consumer and for concessionaire. With higher voltage levels under heavy load, consumer is assured that their equipment will not be subject to voltages below the regular level at the end of the feeder. For a distribution system predominantly modeled at constant impedance, higher voltages mean more revenues for the distribution company. On the other hand, loads with constant power behavior have their electrical losses decreased when subject to higher voltages, which minimizes the loading on conductors and allows the system to provide more useful electricity to consumers. Finally, we shall highlight the performance of the intelligent strategy facing the purposes of this paper. The validation of this intelligent strategy through real data from distribution substations acquired from simulations, laboratory testing and field testing presented highly satisfactory results, contributing to improve the voltage regulation in electricity distribution systems. 1 ANEEL. Resolution No. 505/2001 – Provides for the conformity of steady-state voltage levels. ANEEL – Agência Nacional de Energia Elétrica. Access on 7/26/2006, available in: http://www.aneel.com.br. 2 DUGAN, R.C., McGranaghan, M.F., Santoso, S., Beaty, H.W. Electrical Power Systems Quality. New York, Ed. McGraw Hill 2nd ed., 2003, 528 p.
3 Choi, J.H., Kim, J.C. The online voltage control of ULTC transformer for distribution voltage regulation. International Journal of Electrical Power & Energy Systems, vol. 23, 2001, p. 91-98. 4 Hu, Z., Wang, X., Chen, H., Taylor, G.A. Volt/VAr control in distribution systems using a time-interval based approach. IEE Proceedings – IEE Generation, Transmission and Distribution, vol. 50, 2003, p. 548-554. 5 Liu, Y., Zhang, P., Qiu, X. Optimal volt/var control in distribution systems. International Journal of Electrical Power & Energy Systems, vol. 24, n. 4, 2002, p. 271-276. 6 Hsu, Y.Y., Lu, F.C. A combined artificial neural network-fuzzy dynamic programming approach to reactive power/voltage control in a distribution substation. IEEE Transactions on Power Systems, vol. 13, n. 4, 1998, p. 1265-1271. 7 Liang, R.H., Wang, Y.S. Fuzzy-based reactive power and voltage control in a distribution system. IEEE Transactions on Power Delivery, vol. 18, n. 2, 2003, p. 610-618. 8 Dixon, M. Innovative Volt/VAr management provides payback, in Proc. IEEE/PES Transmission and Distribution Conference and Exposition, pp. 461-468, 2001. 9 LEE, C.C. Fuzzy logic in control systems: fuzzy logic controllers – Part I and II. IEEE Transactions on Systems, Man and Cybernetics, vol. 20, 1990, pp. 404-435.